Our Asthma Awareness Stretch Bracelet is made to fit your wrist comfortably without feeling too tight. Made from high-quality beads on a durable stretchy band. 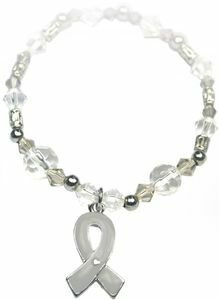 A gray enamel ribbon charm dangles from the center. Wonderful way to show your support for someone with Asthma or to help raise awareness. Excellent for resale, gifts or to give away.